Ohain, Walloon Brabant, Belgium, the location of the Home of Hope, a children's home established in 1952 by the Belgium Mennonite Mission (Mennonite Church). In the 1950s it served some 25 abandoned children. Bender, Harold S. "Ohain (Brabant-Wallon, Belgium)." Global Anabaptist Mennonite Encyclopedia Online. 1959. Web. 26 Apr 2019. http://gameo.org/index.php?title=Ohain_(Brabant-Wallon,_Belgium)&oldid=93166. Bender, Harold S. (1959). 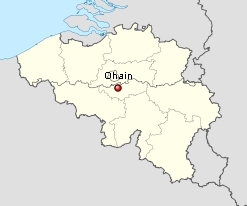 Ohain (Brabant-Wallon, Belgium). Global Anabaptist Mennonite Encyclopedia Online. Retrieved 26 April 2019, from http://gameo.org/index.php?title=Ohain_(Brabant-Wallon,_Belgium)&oldid=93166. Adapted by permission of Herald Press, Harrisonburg, Virginia, from Mennonite Encyclopedia, Vol. 4, p. 24. All rights reserved.